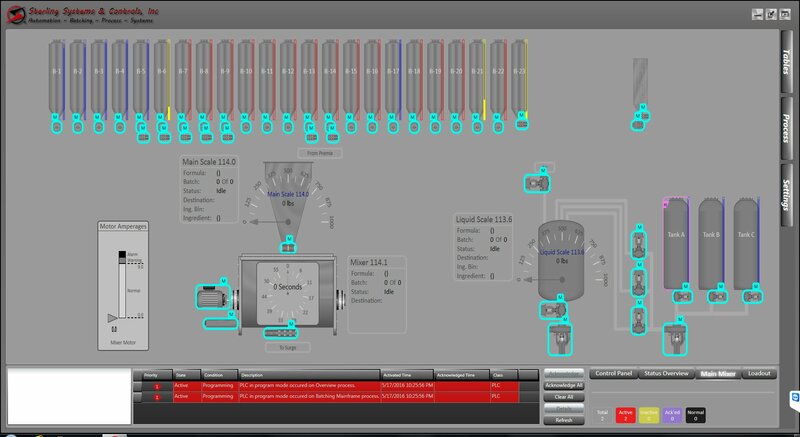 No matter what your Application requirements are, Sterling Systems & Controls, Inc. can design a customized system meeting your specific needs. Therefore, we provide you the ability to receive, move, blend, mix, sort, size, weigh, batch and loadout your bulk materials accurately and more efficiently. Sterling Systems & Controls is committed to providing you with a highly efficient and affordable systems solution. Micro ingredient system, minor/major ingredient automated batching system, bulk bag unloading, or plantwide automation, there is no need to compromise. Special orders don’ upset us, we thrive on them! Our industry seasoned and expert engineers will design and customize your next process system to meet your specific requirements. We will provide the process equipment you need, and design and build your electrical and process automation control panels in our UL Listed panel shop. We provide state-of-the-art process equipment and electrical/electronic hardware, as well as custom engineered software. Contact us today 815-625-0852, or toll-free in the USA at 800-257-7214. You can email us at sci@sterlingcontrols.com. Don’t wait a minute longer, tell us today what you need and want to do, and find out how we can meet your specific application requirements with a custom quotation!